Being Self Sufficient In Wales: This Has Angered Me !!!!!!!!!!!! I dont usually bring family stuff to my blog but this had made me angry. I got a call today from my daughter she was in hospital, she had been attacked by an Alsation dog while working delivering leaflets. The dog owner didn't call an ambulance thought my daughter was going to call them, when she phoned them herself they talked her through what to do and asked if she could arrange transport to hospital, she phoned her husband at work to collect her, she then waited an hour in A&E in Milton Keynes before being seen, to be told they were not going to treat it and wanted her to go to Oxford for treatment, Martin took her to Oxford about an hour away, they are operating tomorrow morning on her leg. They have her on a IV tonight. The whole thing has left me fuming the dog owners lack of concern, the ambulance service and MK hospital. I have spoken with my daughter she is alright in herself although very shook up. Your poor daughter, no wonder you are angry. Hope she is soon on the mend. No doubt she will report the dog owner, they should not have dogs if they cannot be responsible. I would be mortified if my Labrador bit anyone. This is indeed distressing and quite an awful injury. I don't blame you for being angry. It is so hard too see stuff like this happen to our kids, noatyet how old they are. The dog owner sounds like a nightmare. Amazes me how irresponsible and uncaring some people are. Hope your daughter is ok and you too. And we have "the best health service in the world". It makes your blood boil when you hear the reports of neglect. Out hospitals may well be short staffed but the dedication of some of those staff members is certainly not angled towards their patients. I spent much of three months in 2004 visiting my patents in 2 separate hospitals and saw the slap ship attitude of some staff. What a nasty dog bite, and no wonder you are angry. It would have been bad enough if everyone had taken the time to look after your daughter, but to have had this neglect of care is atrocious. I actually feel quite angry about it as well! I am so sorry to read this. I hope it goes well for her today. Ouch - that looks nasty! The dog owner should be charged for not restraning a vicious dog properly and should certainly pay whatever medical bills there are. As for the medical reaction - sounds like here...!?! 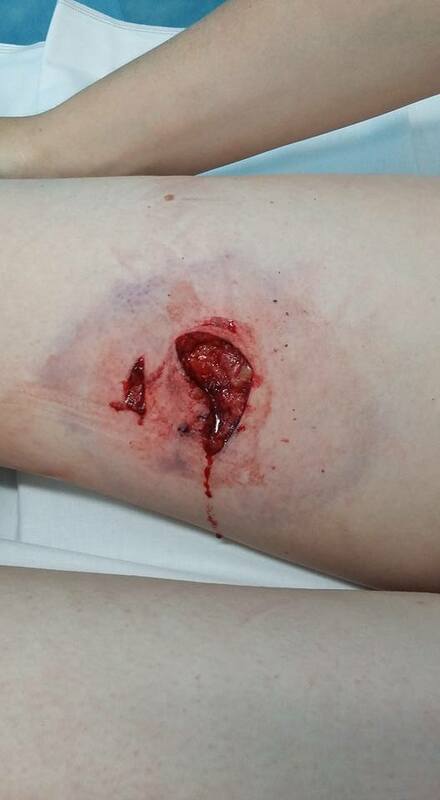 Oh Dawn I'm so sorry, that's a really nasty looking wound, no wonder your daughter is shaken up. How unbelievably callous of the dog owner not to call an ambulance, you'd think that was the least they could do. So was there no triage in MK hospital to see her straight away? The poor girl, I hope the op goes well. I'm sorry, but with a bite that bad the dog should be PTS. Imagine if it had been a child? Your daughter must have been so shocked - it's SUCH a deep and nasty bite, proven by the need for surgery, for heaven's sake. I hope that she is on the mend soon but she will be left with a scar . . . Terrible response from the ambulance service and the NHS, it's always a shame when they don't react in a response suitable for the injury. Something like a dog bite always carries infections and that looks like a nasty one. This should be reported to the police. For a dog to do this it must have bitten before and the owner MUST have known. The medical help she got was atrocious. I guess she was too polite to demand an ambulance as many do for far less an injury. No wonder your blood is boiling mine would be too. My ex-husband was also bitten by a dog while delivering leaflets many years ago, but with him it was his fingers, he put the leaflet through the letterbox and a dog had hold of his hand before he could pull it out. It took ages to get better and he needed a couple of courses of antibiotics, he was left with damage to two of his fingers and still suffers in cold weather. I hope your daughter is soon feeling better and that she can come and give your dog a big cuddle before any fear sets in. You can't believe how angry I feel on your and her behalf. It's dog owners like this that get all the good owners and well trained dogs a bad name. She does have a dog of her own so I dont think and hope she dosent have a fear of dogs after this, she is far to polite and wouldnt have pushed for medical help. What a terrible thing to have happen. Some dog owners are dreadful. Hope the operation goes well. Hope all goes well for your daughter Dawn. My dad was a milkman for many years and bitten several times, he always blamed the owner's for not being responsible for their dogs actions. Once he got bitten on the behind as he put some milk down on a step, we laughed about it for years afterwards, but at the time it caused him great distress. I believe changes this year to the dangerous dog act and in particular extensions to section 3 now include attacks on private property. Police should now be able to intervene, failing that a solicitor. I hope your daughter is feeling better today, the dog owner is disgusting in their behavour to your daughter, as for the NHS, it's not the service we think it is, they are great if your treatment is planned and everything is booked. A&E is a nightmare and now they are putting certain services in bigger specialist units, it can mean so much traveling. Su had to get David last weekend from Silverstone to hospital in a taxi, he then sat all night in waiting room chairs, when she complained, she was told he had no where to go. but they would not release him to get back and rest. It's a sad service, which is a shame when the staff work so hard. Wishing your daughter a good recovery. I am appalled that the dog owner didn't even ring for an ambulance........that was awful. How dreadful, hope she is soon on her way to a speedy recovery. Been away for a couple of days with hospital appts for my husband so just catching up with blogs. My goodness, that's a nasty wound and I fully understand your anger. Hope she recovers fully. If you want to talk to a lawyer specialising in personal injury involving dogs, let me know. I hope your daughter recovers soon.